Getting around Dubrovnik by boat? At least in the summer months it's by far the most pleasant mode of transport. Three separate boat lines run regularly all summer. The short trip from Hotel Lapad on the Lapad peninsula to Gruz harbour is highly convenient for picking up one of the ferries to the Elaphiti Islands. As the Dubrovnik bus station is within easy reach of Gruz, there's no need to wait for the bus. The second line connects Gruz and Hotel Lapad with the beaches of Babin Kuk, leaving a few times in the morning and returning in late afternoon. 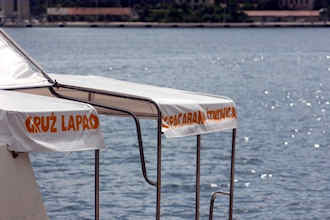 The third line connects Mokosica with Gruz harbour before heading to the Old Town and then on to Lokrum Island. This is most convenient for those staying in Mokosica where there's a lot of reasonably-priced accommodation and provides another boat out to leafy Lokrum island. The service is free to those with a Dubrovnik card and will eventually be extended to the Elaphiti Islands.